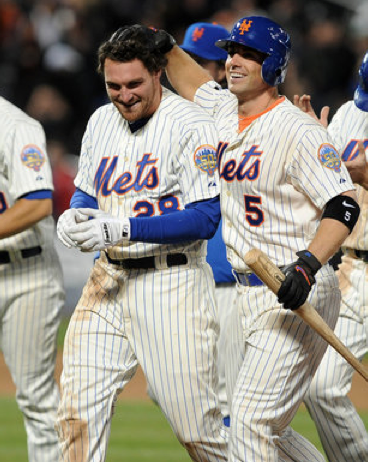 David Wright's BA: .583; he's within 4 of the Mets' all-time RBI record. 10 players are batting over .300, including 3 pitchers. Jon Niese threw a no-hitter into the 7th inning the other day; it was broken just as his pitch count neared its maximum. Daniel Murphy not only drove in the game-winner last night, he made a stellar defensive play. DEFENSIVE play. The newly reconfigured Citifield Stadium seems to have relieved at least (and most importantly) Wright of some anxiety, even if it's coincidental. They swept eternal foe Atlanta, and Chipper Jones wasn't playing. RA Dickey climbed Mt. Everest and blogged and lived to tell about it. The Yankees were swept in their opening series against Tampa Bay. I don't want to pick on poor Joba Chamberlain because that is one horrific injury, but... a trampoline? The Marlins, in a brand new stadium with a retractable roof and friggin' fish tanks as backstops, and shiny new shortstop José Reyes, bought from the Mets, just had their manager Ozzie Guillen suspended for five games for proclaiming his adoration of Castro. Of course I don't expect it to last. Statistically it can't, and honestly, I've been a Mets fan for too long to believe otherwise. But for the moment, let me savor the situation.